Top your Barrett’s Ridge Masala beer bread with chutney. Two South African favourites in one flavoursome feast. Pour entire contents of Barrett’s Ridge Masala into a bowl. It’s a meal of masalas when it comes to this particular bread mix. So, of course we’re going to recommend serving your loaf with a curry! Not only are the spices a perfect match, but the sweetness of the Pilsner will enhance the sweeter flavours in your curry. Caramelised onion is the perfect addition to Barrett’s Ridge Masala beer bread. Add a little muscovado sugar to the pan for deep caramelisation. 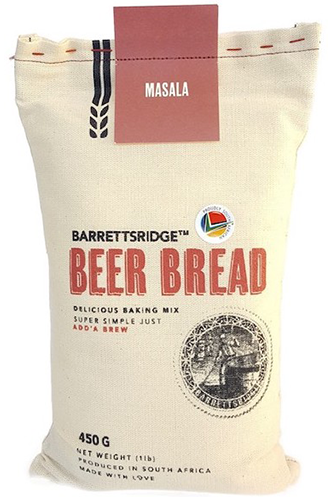 The Barrett’s Ridge bread bakers recommend pairing our Masala Mix with Pilsner. The perfect pair of sugar, spice and everything sliced.